This is a follow-up to a post I wrote a few days ago about receiving our first Creation Crate. Kiera built the mood lamp tonight. I shot a few photos of her progress. We started by laying out all of the parts, and then she went step by step through the instruction booklet. 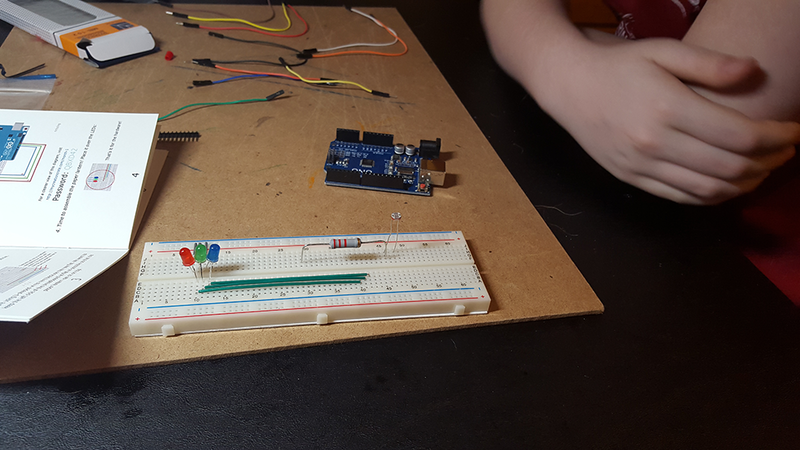 She started by placing her RGB LEDs, 2.2k Ω resistor and light sensitive diode on t he breadboard. Next, she added some flat jumper wires to give herself some room to work with, since there's a paper lantern that goes over the LEDs on the finished lamp. 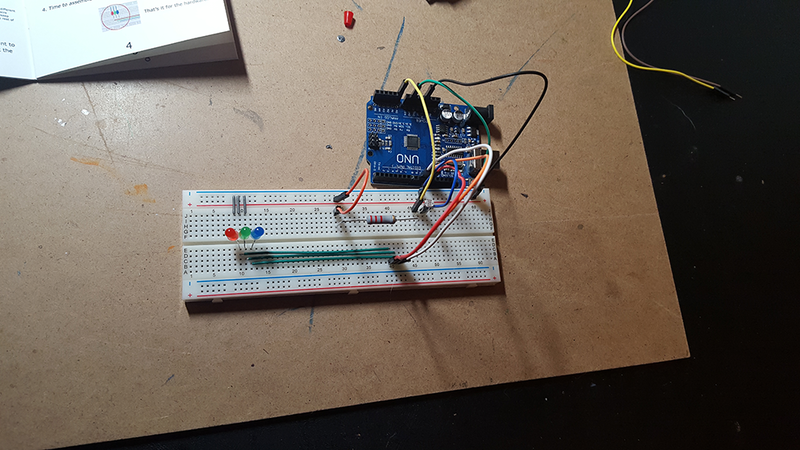 The third step of the build process was to wire the LEDs and diode up to the proper pins on the Arduino. 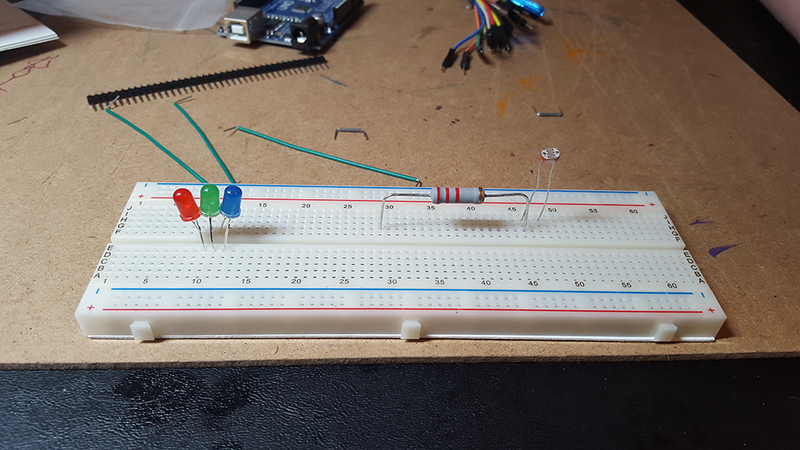 My only complaint about breadboarding electronics as opposed to hard mounting them - this step always looks messy. 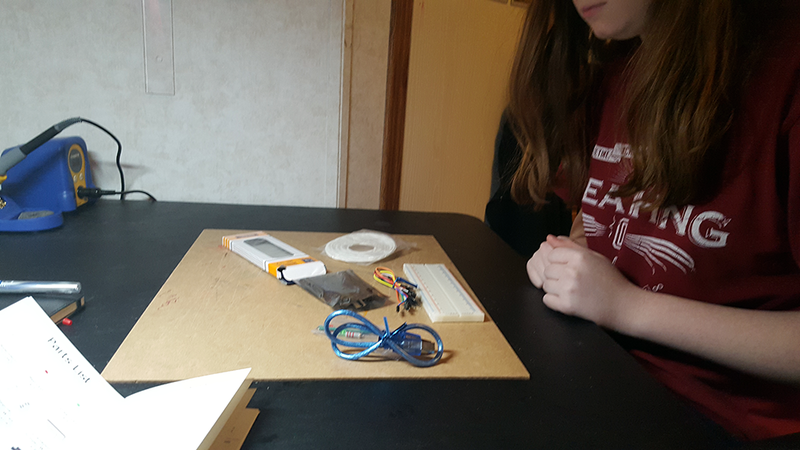 She had no trouble with it, though, after I explained a couple of things about the power rails on the breadboard and the GPIO pins on the Arduino. Next up, we plugged everything into the Mac, fired up the IDE, and turned to the sample code in the book. And herein lies my only complaint about the kit and the project. The sample code in the book is offensively unindented, which made it very hard for her to follow as she read along (and made her mother itch). Also, for a first project, while, overall, the code is fairly short and concise, it has a bit of confusing math for calculating RGB values that could throw off kids digging into this for the first time -- not that they shouldn't learn it, just maybe not on the first project. You'll see what I mean in the gist below. Kiera got it, but it slowed her down for a moment while she stopped and worked through it in her head. Ultimately, that's a good thing but for younger kids, it might be too much in conjunction with also taking their first foray into C programming. Ideally, in a classroom setting, you'd discuss the math of what's going on before you started the programming phase - which is probably Creation Crate's intention. But no one said learning this stuff would be easy. If it was, we'd all be mathematicians, software developers, and electrical engineers. In the end, she got it working and here's a quick glimpse of the finished result. Pretty neat! We'll definitely be keeping our subscription for at least a few more months. Also, thanks to the Creation Crate folks for including the Uno R3 Mac driver on their resource page for this project. I'd not used the Uno before, just the Mega, which didn't have any driver requirements, so having this file reasily available saved me some time and frustration in debugging when we couldn't upload our sketch.